@IndiaJoze just dropped by a used full-kitchen wok stove, with two main burners and a stock burner in the back. 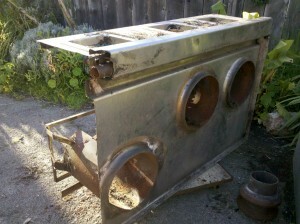 We have some ideas to simply mount wheels and use propane burners until we can build out the outdoor kitchen. What to use this for? All part of our urban farm, Fairy-Tale Farm, for demonstrations, workshops, garden and food prep, and long, hot boiling of stuff during long, hot summer days … such as canning. Comments closed — Trackbacks closed RSS 2.0 feed for these comments This entry (permalink) was posted on Wednesday, March 30, 2011, at 7:53 pm by quaid. Filed in Fedora, Urban Farm and tagged fairy-tale farm, outdoor living.